A plan outlining all details of the UAT is drawn up. Test cases are designed so that they cover all the functional scenarios of the software in real-world usage. They are defined clearly for the convenience of the testers. A testing team made up of real-world end users is created. The testing team executes the test cases, and possibly some additional tests. Bugs and comments are logged. The software development team resolves the reported bugs. When the bugs have been fixed, the testing team indicates acceptance of the software application, which indicates that the application meets user requirements and is ready to be rolled out in the market. the reason he/she needs it. This provides a valuable guideline for the UAT. The feature has been defined, and what kind of user the feature is for and how she or he will benefit. The acceptance criteria should become apparent during Backlog Refinement, which is done by the Product Owner and the Development Team. In this session they collaborate on the details of user stories, including acceptance criteria. Additional user acceptance testing criteria may also be defined, for particular features – functional or non-functional. An increment is only considered to be done when it is a working – meaning fully tested – piece of software, fulfills the customer need, has the feature that the customer wanted and meets all the acceptance criteria. In Agile teams, the Product Owner has the responsibility of maximizing the value of the product, and represents all stakeholders, including customers and users. The Product Owner is the other authorized entity mentioned in the definition of User Acceptance Testing. The Product Owner must work in close collaboration with stakeholders to understand their expectations and help the scrum team to understand. The Product Owner collaborates closely with the Development Team to give feedback about the product. She will accept a user story to be done when it meets the definition of done. During Sprint Review, feedback should also be collected from all stakeholders as input for the Product Backlog. This continuous feedback loop enables the Scrum team to deliver what the Product Owner and stakeholders want. There can be challenges when a team works only on a small part of the bigger chain and doesn’t integrate with the other software components in the chain until the very end, for testing as a whole. However, this late integration problem can be overcome by reorganizing the teams to become feature teams that are responsible for the entire chain that feature includes. Scrum teams working in the same chain can be brought together, with an agreement to integrate often, or even Continuous Integration. With this approach, all checks defined in the formal definition of User Acceptance Test can be done within a sprint. A Scrum Master should ensure frequent integration. This way, there is no need for an official tollgate, which improves throughput, and reduces the time of the feedback loop. 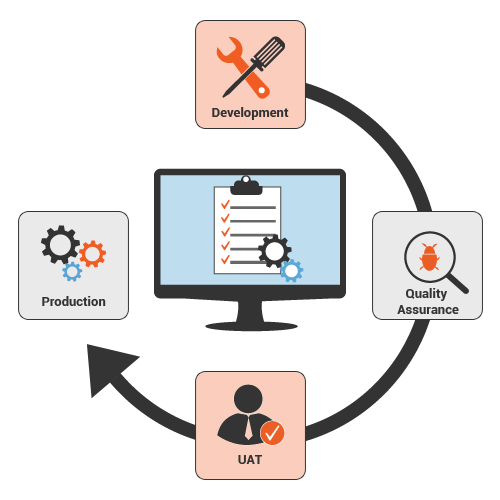 This saving of time makes the product of higher value to the customer, so the objective of UAT is achieved.